Social Media Megaphone: Who’s Listening to Whom? On the way to work today, I heard a radio commercial (don’t laugh but I still listen to terrestrial radio) advertising an upcoming conference in LA billed as everything small and mid-sized businesses need to know to leverage social media for business goals. Now I’m not saying the latest in a slew of social media conferences is looking to exploit the increasing interest in social media marketing, but I’d be lying if I said it wasn’t a concern. 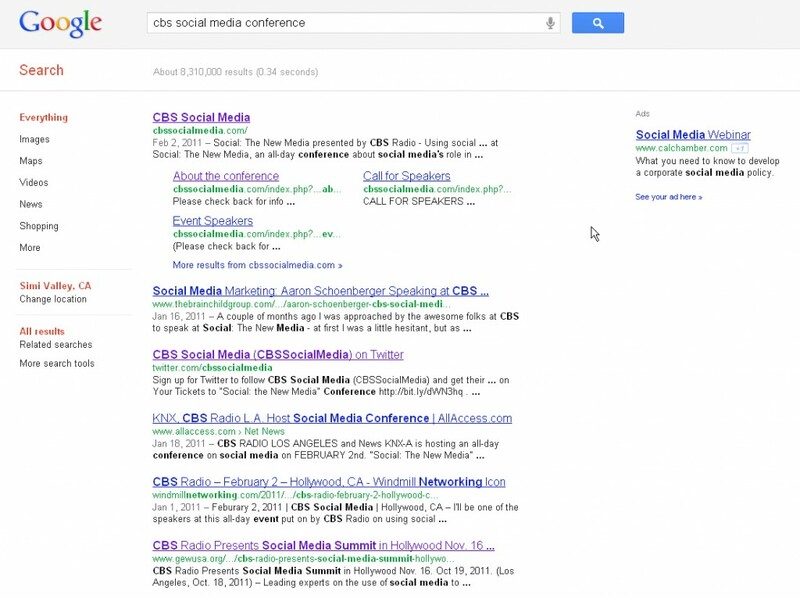 So when I got to the office I searched for a few key terms used in the radio commercial that I thought would bring up the conference website, in the end selecting the Google suggested phrase [cbs social media conference]. While the first result looks topically relevant, it’s dated last February. This same conference must have also taken place earlier this year, soI clicked through to the site hoping to be redirected or to find content has been updated or something pointing me in the right direction. No luck there. All that’s explained is the event is scheduled for eight months ago and is sold out. Alright, they must have created a whole new site this time around. Dumb, but I still wanted to find it. I clicked the Twitter button from there to see if I could find a website on the event’s Twitter profile and, what do you know, the Twitter user doesn’t exist. They deleted the Twitter account? Back to the SERP I went. Coincidentally, I’m attending Facebook’s Marketing Bootcamp, which kicked off this week. The six-part webinar series produced by Facebook has a mission similar to the questionable conference, but there’s no comparison when it comes to credibility. In the second part of the series, we learned Facebook’s five suggestions for a good brand page, best practices for posts, and tips for growing your fan base. Facebook’s own teach the webinar, answer questions live, and follow up with an email containing a checklist that will help you efficiently accomplish the recommendations made during that week’s webinar. The team also points the audience to further resources on successful Facebook marketing, like the case studies found at facebook.com/marketing. One very enlightening Facebook marketing case study you won’t find there is the story of Doug and the Ford Focus. Small advertisers including local businesses and small-scale websites make up the majority of ad spend on Facebook. Facebook pages themselves are free. However, let’s not forget the time and production costs that went into Doug the sockpuppet’s campaign. A Facebook page is just one-piece of a healthy media campaign. It requires support from multiple channels to truly leverage its potential. Ford eschewed Facebook’s paid advertising options, trusting the word-of-mouth approach instead. I figure they’re onto something regarding the mental state of an average Facebook user, an induvidual who’s highly likely to become a fan of a brand on Facebook to indicate their support to others. This post comes full circle when we understand that with social media, as with life, we have to be careful who we listen to. Be sure you can trust who you’re taking professional advice from, and always look to the experts. And know that when your audience is looking for info or recommendations, they’re quite likely looking to their own friends. Be in the right place on both sides of the influence game. Learn from the best and be the business your customers want to brag about.